With the Jewish New Year only 19 days away, we're starting our countdown to Rosh Hashanah with a musical greeting from the Fountainheads of Midreshet Ein Prat. Earlier this year we shared videos by the Fountainheads to celebrate Purim and Pesach. 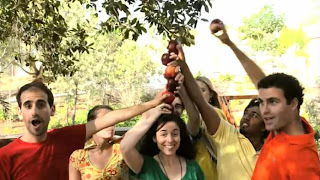 Now we bring you their latest video conveying Rosh Hashanah wishes for a Happy New Year. We think it's their most energetic, enthusiastic, exuberant production yet. Enjoy! Thank-you SO MUCH for turning me on to these kids.......They are fabulous-and GLEE has NOTHING on them! I'm going to send this to everyone to enjoy for Yuntif! Have a Happy and Sparkling New Year! A wonderful and uplifting video. I sent it to everyone I know and posted it on facebook. It is a perfect way to let the world understand the meaning of Rosh Hashana.BRAVO! !